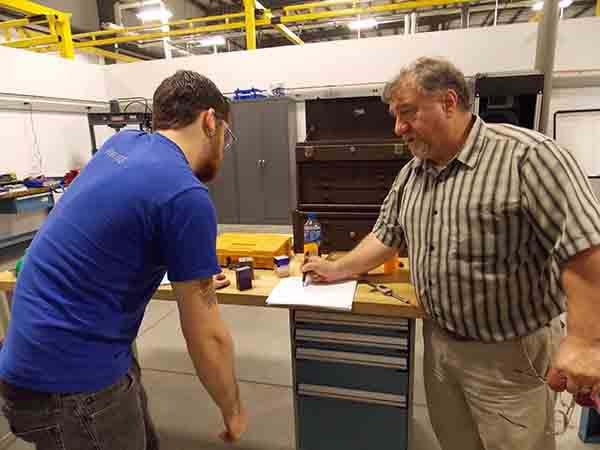 Every Saturday morning at IMS Gear in Virginia Beach, Tidewater Community College transforms a portion of the high performance manufacturing company into a college classroom. The instructor is TCC’S Rick Dyer, a Navy veteran whose machine shop days date back to New England 40 years ago. His students are machinists from IMS Gear, Sumitomo Machinery Corp. of America and Busch LLC, all taking part in an innovative partnership that benefits everyone involved. The companies are not competitors; however, they require a similar skill set. TCC provides the instruction and curriculum, which Dyer wrote, tailoring it to the employers’ needs. IMS Gear supplies lab space, metal materials and necessary machinery at no cost. The employees make themselves more valuable to their employers and improve their opportunity for advancement. Including employees from Sumitomo and Busch extends the collaborative effort of this unique partnership, which started as a pilot program last spring. “This model is particularly relevant for small- and medium-sized employers who might not have the resources to provide direct skills training to their workforce or who might not have the need for a full-scale apprenticeship program,” said TCC President Edna V. Baehre-Kolovani. Gear, Sumitomo, and Busch LLC. Twelve students completed the inaugural program in May and moved on to Phase II, taught from 8 a.m. until 1:30 p.m. on Saturdays. A second program on Tuesdays and Thursdays taught by TCC’s Brian Stevenson is an introductory class for a second cohort of employees from each of the three companies, and a third phase focusing on numeric controls will begin this spring. After the employees complete the second phase, they are prepared to take the National Institute for Metalworking Skills exam, which allows them to earn a valuable and portable credential. While classes includes lecture and written material, the majority of them are hands-on, with Dyer offering individualized attention as questions arise. The friendly atmosphere encourages the students to learn from others. “They’re teaching one another, and getting out of the habit of keeping knowledge to themselves,” Dyer said.